Light the Fire Again, Toronto – Passing The Torch airs LIVE in the USA from April 25 – 28th. You can watch the evening sessions on GOD TV LIVE in the USA and in other regions the following day. Other sessions will be available on our Special Events LIVE Stream. The event aims to rekindle the fires of revival of the 1990s. So many of today’s ministries have been influenced by, or come out of the Toronto Blessing which took place in Canada in the 1990s. Just some of these include the Alpha Course, Brownsville Revival and Bethel Church. Now Christ for all Nations (CfaN) is hosting a special event on the historic site of the outpouring, to rekindle the flames of revival. Led by John and Carol Arnott of the Airport Vineyard Church (now Catch The Fire) along with Randy Clark of Global Awakening, the Toronto Blessing had a wide-reaching effect. Now John Arnott and Randy Clark are back at the Attwell Centre along with Daniel Kolenda and other best-loved speakers. These include John Kilpatrick, Lou Engle, Heidi Baker, Rick Joyner and Dr Michael Brown. Worship leaders include Don Potter and Lindell Cooley and Jeremy Sinnott. 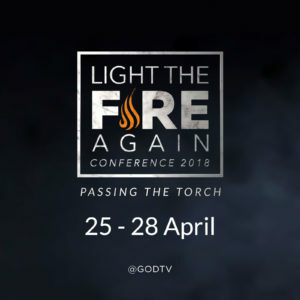 “We’re believing God to begin anew the mighty move of His Holy Spirit that swept across the Earth at the close of the Last Century,” said Daniel Kolenda who leads CfaN, Watch on GOD TV and be part of this historic gathering of leaders from the great, global moves of God at the close of last century. Other regions can watch these broadcasts the following day.